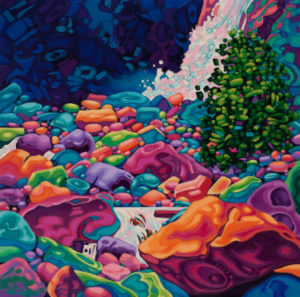 Brightly colored rocks and the contrast between light and shadow drive the joy and drama in this painting of Lower Yosemite Falls. The bottom part of the waterfall plays a minor supporting role, even against the starkly accented deep blue-violet cliff wall. The water disappears as it threads between and under the rocks, which are the true stars here. Sometimes, I simply long to get lost amongst these stones.